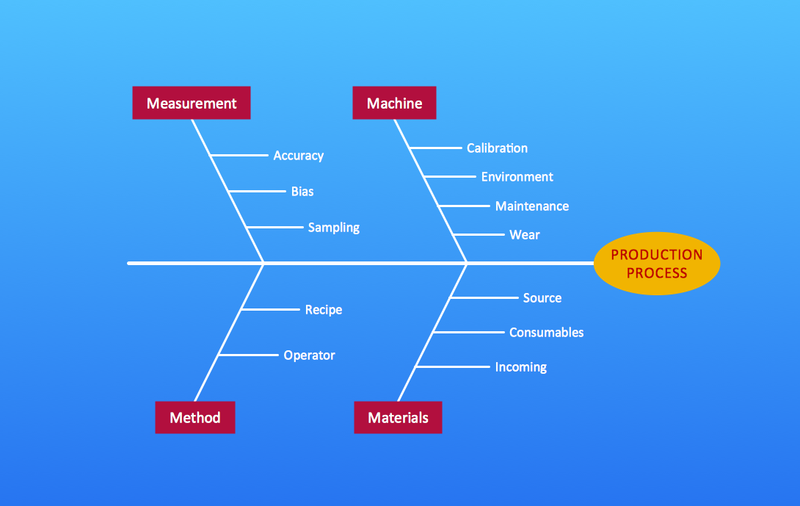 Fishbone diagram, often referred as Cause and Effect diagram or Ishikawa diagram, is one of the basic and the most effective graphic tools for problem solving. It is a way of graphical identifying, structuring and exploration the root causes of a problem for determining effective decision. The causes on a diagram are grouped into categories and are depicted in a form which resembles a fishbone. 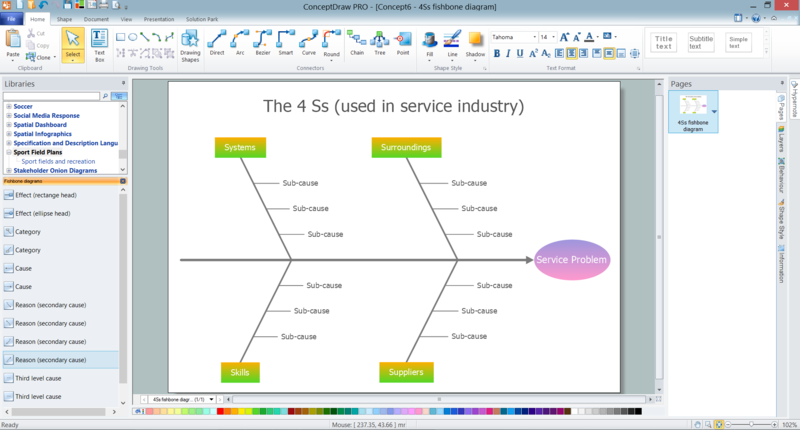 ConceptDraw DIAGRAM enhanced with Fishbone Diagrams solution is a professional fishbone problem solving tool which helps you draw Business Productivity diagram, Cause and Effect, Fishbone, Ishikawa Diagrams to solve problems at your business. Fishbone Diagrams Solution as a fishbone problem solving tool lets easy design Fishbone diagram, show factors of Equipment, Process, People, Materials, Environment and Management, all affecting the overall problem in one drawing for further cause and effect analysis. Drawing process in ConceptDraw DIAGRAM is reduced to some easy steps, you can fully concentrate on the problem and draw diagrams using the predesigned objects from Fishbone Diagrams library. Fishbone Diagrams solution contains also a set of different examples, samples and templates, all they are available from ConceptDraw STORE. You can open them and change something, as needed, and thus get your own new Fishbone diagram. The samples you see on this page were created in ConceptDraw DIAGRAM using the tools of the Fishbone Diagrams Solution. These diagrams successfully demonstrate the powerful capabilities of ConceptDraw fishbone problem solving tool. An experienced user spent 10 minutes creating each of these samples. 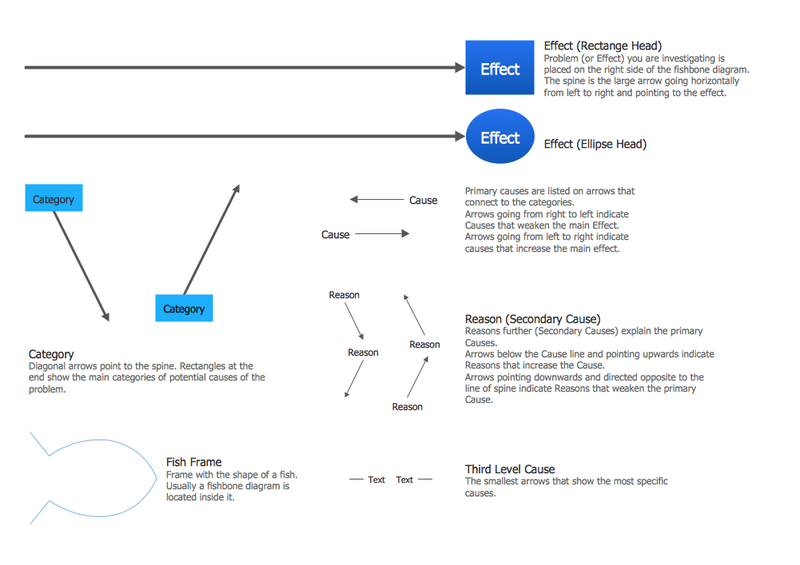 Use the Fishbone Diagrams Solution for ConceptDraw DIAGRAM for effective cause and effect analysis and problems solving. ConceptDraw DIAGRAM v12 enhanced with Seven Basic Tools of Quality solution from the Quality area of ConceptDraw Solution Park is an ideal software for fast and easy drawing professional looking quality diagrams, including a Fishbone diagram.